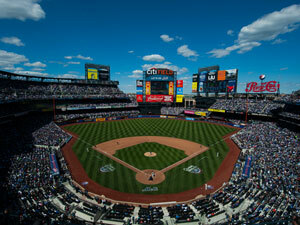 The Mets will host the Major League Baseball All-Star Game in July 2013 at Citi Field! Baseball's best players will descend on New York City for three days of events at Citi Field leading up to the 84th All-Star Game, scheduled to be played on Tuesday, July 16, 2013. It's the first time the Midsummer Classic will take place at the home of the Mets since 1964. Want to be there to catch all the All-Star action at Citi Field? Secure your access to purchase 2013 MLB All-Star Event Ticket Strips today! Become a Full Season or 40-Game Plan Holder for the 2013 season and you'll be eligible to purchase the same number of seats that are in your 2013 Full Season Ticket or 40-Game Plan for all 2013 MLB All-Star events. Or, purchase a 2013 15-Game Pack in any Field Level or Caesars Box location and you'll be eligible to purchase an upper level All-Star Ticket Strip for each seat in your 2013 or 15-Game Pack. Don't miss your chance to be a part of the All-Star Game that fans will be talking about for years. Purchase a qualifying 2013 Mets ticket package today! Please contact the Mets Ticket Office at 718-507-TIXX (8499) if you have any questions about 2013 MLB All-Star Game ticket access. Tickets for All-Star Week events will be sold as "strips" only. There are no exceptions to this Major League Baseball policy. Dates are subject to change. Due to Major League Baseball requirements, seating locations cannot be guaranteed for 2013 MLB All-Star events. While effort will be made to provide Full Season Ticket Holders with the same seat location(s) as those held in their 2013 season ticket account, in some cases it may be necessary to relocate these seats for 2013 MLB All-Star events. In the event a Full Season Ticket Holder must be relocated, the Mets will work with them to secure the best available alternate location. For accounts with less than 81 regular season games in 2013, seating locations for 2013 MLB All-Star events are likely to vary from that of their 2013 regular season seats. Please note that in all cases, seating and price category preferences are not guaranteed for All-Star Ticket Strips. Details: Qualifying 2013 Full Season Ticket, 2013 40-Game Plan, 2013 and 2013 15-Game Pack Holders will be eligible to purchase the same number of seats in their 2013 season ticket, or 40-game plan, or 15-game pack account for each of the All-Star Week events to be held at Citi Field in July 2013, while available, and provided their 2013 account is paid in full or enrolled in an approved payment plan. Maximum six (6) full season, 40-game plan or 15-game pack seats per account. Tickets for All-Star Week events will be sold as "strips" only. Each strip includes one (1) ticket to each All-Star Week event at the ballpark, two (2) MLB All-Star FanFest tickets and one (1) official All-Star Game program. There are no exceptions to this Major League Baseball policy. Due to Major League Baseball requirements, seating locations cannot be guaranteed for 2013 MLB All-Star events. While effort will be made to provide Full Season Ticket Holders with the same seat location(s) as those held in their 2013 season ticket account, in some cases it may be necessary to relocate these seats for 2013 MLB All-Star events. In the event a Full Season Ticket Holder must be relocated, the Mets will work with them to secure the best available alternate location. For accounts with less than 81 regular season games in 2013, seating locations for 2013 MLB All-Star events are likely to vary from that of their 2013 regular season seats. Please note that in all cases, seating and price category preferences are not guaranteed for All-Star Ticket Strips. Pricing for 2013 MLB All-Star events will be determined by Major League Baseball. Opportunities for account renewal shall be subject to the terms of the Club's renewal policy, as may be amended from time to time, and all applicable rules, regulations and policies including those set forth on the back of each ticket. Ticket buyers have no automatic right to renew their tickets the following season; all renewals are at the discretion of the New York Mets. The New York Mets reserve all rights to establish season ticket and ticket plan prices, account holder privileges, and all other terms and conditions, on a year-to-year basis, including the right to impose a cap on the number of tickets sold to each individual account purchaser, and to make seating adjustments to accommodate Major League Baseball, Club, ballpark or other requirements. All non-renewed seat locations will be assigned at the discretion of the Mets. Seat views available on the mets.com seating & pricing page cannot be relied upon as exact views. Season ticket or ticket plan buyers are subject to and responsible for compliance with all terms and conditions of purchase or use of Mets season tickets or ticket plans, whether set forth herein or elsewhere (including in any confirmation of a season ticket or ticket plan purchase).